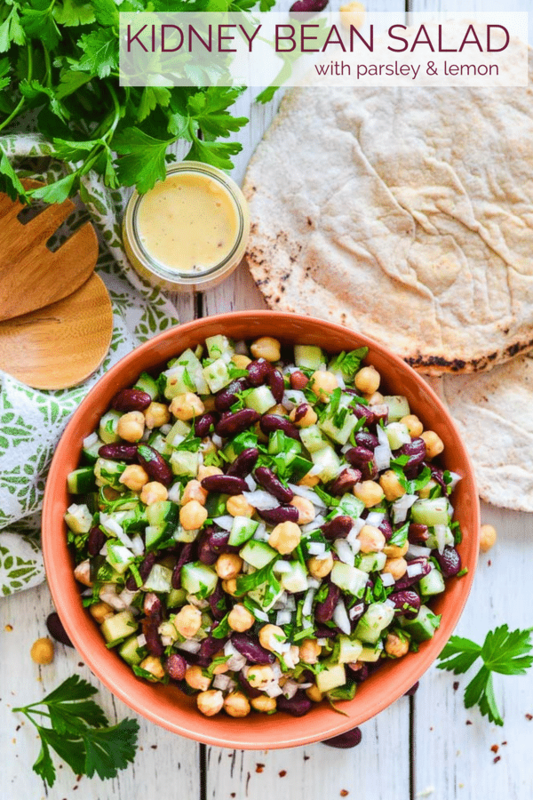 This simple, protein packed Kidney Bean Salad with Lemon & Parsley is filled with texture & bright, refreshing, zesty flavours. Perfect for a healthy, light lunch or as a side! 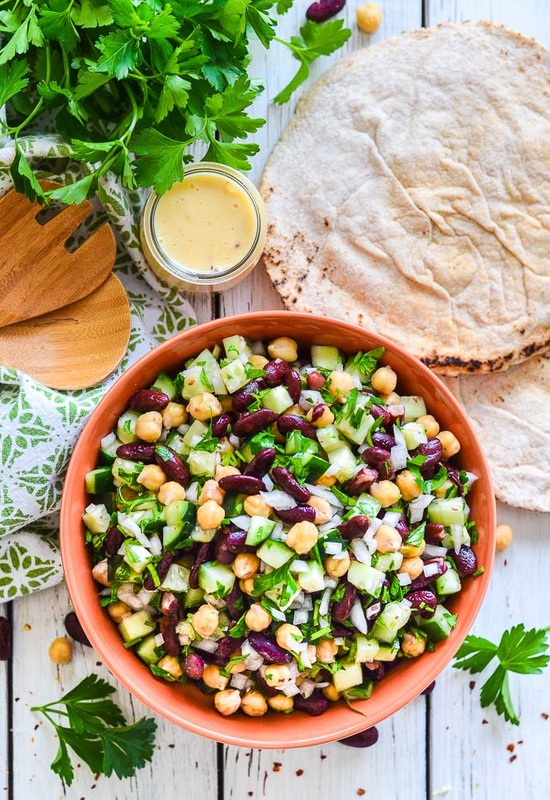 Even in Winter the odd salad is necessary to lighten things up and I’ve been going all out with this Kidney Bean Salad of late. It wasn’t intended for here. I just made it for lunch one day and shared it on my Instagram stories. I didn’t think anyone would be interested but you proved me wrong with lots of messages asking me for the recipe. 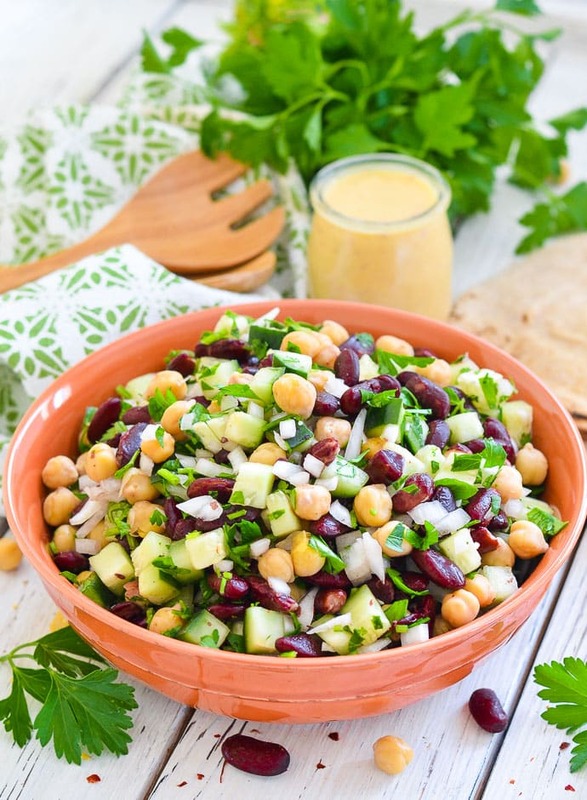 This protein packed salad is loaded with kidney beans, chickpeas, cucumber, sweet onion and parsley and is finished off with a lovely drizzle of lemony, garlicky dressing. 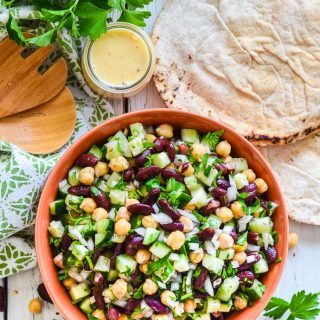 It’s bright, refreshing and just perfect served with my Quick & Easy Homemade Pita Bread for an easy lunch or dinner. With all the beans it’s already pretty substantial, but if you want to make it even more so, try stirring some cooked and cooled quinoa or rice through it. Some cubed tofu would also be a great addition. For dinner last night we had it served with brown rice, a big dollop of hummus and warm pitas straight from the oven. It was so good! 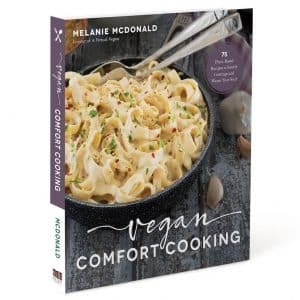 Open a couple cans of beans, or cook ’em up in your Instant Pot (<<affiliate link) because that thing cooks them real fast with no soaking needed! I love my IP – It’s like a bean lovers best friend ???? Mix up those beans with some cubed cucumber, a bit of finely chopped onion, a few fistfuls of parsley, squeeze a lemon, mince some garlic and you’re just about done. Kidney Bean Salad here we come! Put the drained and rinsed beans in a large salad bowl. Add the cucumber, onion and parsley and stir to combine. There are 2 ways to make the dressing. You can simply whisk all of the ingredients together, or put them in a jar and give them a good shake. If you omit the oil you might need to add a touch of water to make up for the lost volume. Or, if you want a creamier dressing and don't mind a much sharper lemon flavour then you can use the whole lemon rather than just the juice. Cut the peel from it with a sharp knife. I cut each end off first then you can stand it on a board and easily cut down and around. Add the whole lemon with the other ingredients to a blender and blitz until smooth. Then add enough water to thin it to the consistency you like. You might want to add a touch more sugar or maple syrup too.You will end up with more dressing than you need by doing this but you can store leftovers in the fridge for another day. Leftovers will keep in the fridge for a couple of days. Just stir thoroughly before serving. Leftover dressing will keep for up to 1 week in the fridge. Calories are calculated including the oil and without sweetener of any kind. 1 serving = 1 cup. This salad look beautifull! Is it possible to describe how u cook the beans in the instantpot ? Thank you. When I use my Instant Pot I don’t bother soaking the beans first. I just put them in, cover with about 3 inches of water and cook. Kidney beans take about 30 mins on high pressure with a natural pressure release. 45 mins if you want to do a quick pressure release.It does depend how old your beans are though. They sometimes take a bit longer, but if you open it and they aren’t done just close the lid and put them back on for a few minutes. That’s it. Done. If you want to inject some flavour into them you can cook them in veggie broth, and add a bay leaf and a few cloves of garlic and some salt. Yum! This is my kind of salad! Beautiful photos, too! So easy and yummy! A lovely fresh salad. It teamed perfectly with some veg chilli we ate with it. I also added some roughly chopped iceberg lettuce, thinking I would make it go a little further, which it did, but he lettuce also gave it a nice bit of crunch. Will make again, and again, and again ……………….! I’m so glad you enjoyed it! Lettuce is a great addition. It’s such a flexible salad. 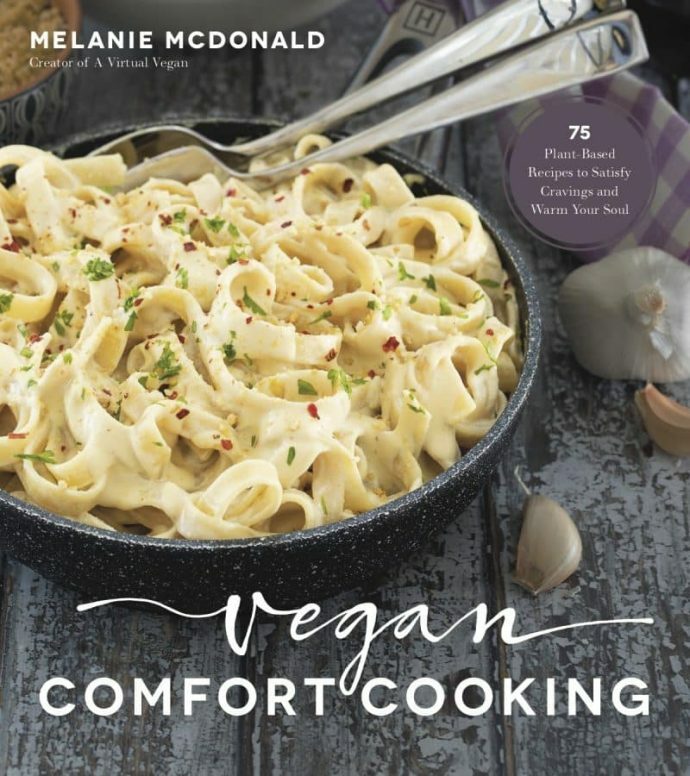 Great for clearing out the fridge! I made it with celery in it yesterday and that was great for the crunch. Thanks so much for stopping by to leave feedback. I really appreciate it! I love the looks of this fresh salad! Sometimes the best recipes come from just throwing things in a bowl. This is perfect for lunchtime any time of year, but I’m especially excited about it for picnics in the summer! It would be perfect for picnics and for summer grilling. I can’t wait to be doing that again! Winter is too long! it IS pretty! we love our pressure cooker – beans and rice are weekly prep around here. I love the look of this salad, and the dressing sounds so fresh and bright! Oh, I love a good bean salad, and this one is top notch, thanks Mel! I LOVE this kind of salad! 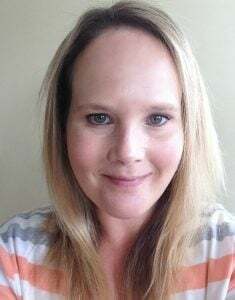 I live on them all summer long, but I think I need to mix some up this week to push away the winter greys!!!! YUM! Thanks Sarah. I don’t eat enough salad in winter and am trying to change that!